The H. haydeniana has a unique defense mechanism when it comes to deterring predators from eating them, they have the ability to produce the toxin, hydrogen cyanide (HCN). The millipede's secretions act as a topical irritant. As a general rule millipedes eject their toxins during the beginning stages of an attack, deterring their adversary before receiving major injuries. (Eisner and Meinwald 1966) Millipedes in contrast to centipedes do not have fangs, however the toxins that they secrete can cause erythema and brown/black pigmentation of the affected area. H. haydeniana has both positive and negative interactions with other organisms. A negative interaction would be any interaction that either has a negative effect on the millipede or other organisms. A positive interaction would be a relationship (direct or indirect) that would have a positive effect on the millipede or the millipede and other organisms. Let’s start out with negative organismal interactions: parasites and predators of H. haydeniana. Nematodes are one of the most common types of endoparasite among millipedes along with Dipterans (flies) in the family Phaeomyidae. Beetles, reptiles, birds, shrews, raccoons and other various mammals, spiders, amphbians, and even snails have been documented to prey on millipedes. (Sierwald & Bond 2007). However, when these animals get a taste for hydrogen cyanide, they’re most likely not going to want to get anywhere near H. haydeniana again. Although these chemical defenses of H. haydeniana are able to keep most predators at bay, one specific beetle is specialized in consuming H. haydeniana. P. laevissimus also lives in California, Oregon, and Washington and feeds on millipedes like H. haydeniana. (Denton 1997). Figure 1. Raccoons are one of the many diverse organisms that may feed on millipedes. Not all H. haydeniana interactions are negative, however, some inter-organismal relationships are quite beneficial. For example, Trichomycetes are obligatory symbiotrophic fungi that live in the intestines of millipedes. The fungi’s mycelia help break down the dead plant material while the millipede’s hindgut provides a habitat for the fungi. (Sierwald & Bond 2007). Sierwald, P. and Bond, J.E. 2007. Current status of the myriapod class diplopoda (millipedes): taxonomic diversity and phylogeny. The Annual Review of Entomology. <URL: http://www.annualreviews.org/doi/pdf/10.1146/annurev.ento.52.111805.090210> Accessed 19 November 2013.
carabidae/GENERA/PROMECOGNATHUS/P_laevissimus.HTM > Accessed 9 November 2013. Wikimedia Commons 2009. 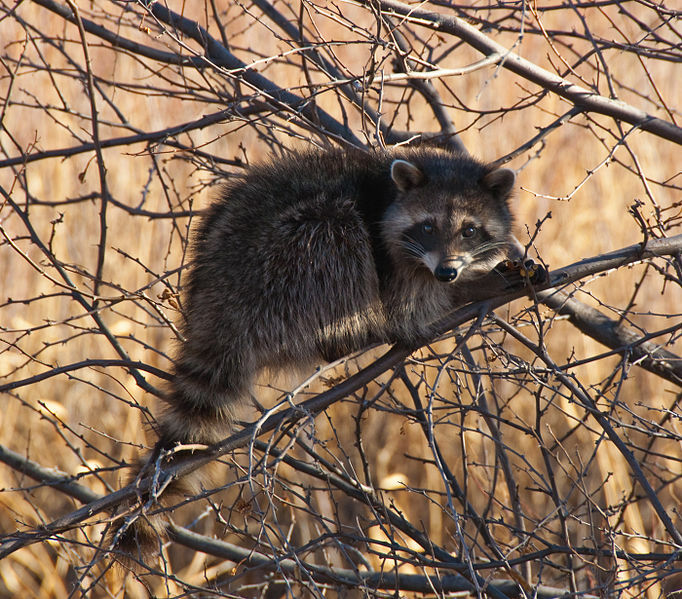 < http://commons.wikimedia.org/wiki/File:Raccoon_(4152678243).jpg> Accessed 5 December 2013. Rockstein, M. 1978. Biochemistry of Insects. Academic Press, New York, New York, USA. Wikimedia Commons 2006.<http://commons.wikimedia.org/wiki/File:Millipede_toes_toxin_diplopoda.png> Accessed 6 December 2013.